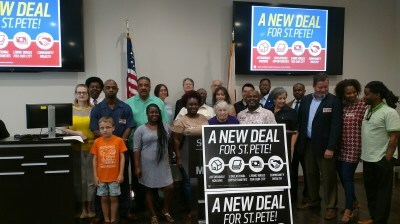 Florida-CEED was created in St. Petersburg, FL, out of the community's strong desire to include cooperative economics in their long-term goals as a city. Out of this effort and determination the new Deal for St. Pete was born -- and revealed a clear voice asking for cooperative business development to be a part of the mainstream of South St. Pete. Florida Cooperative Empowered Economic Development Corp. (Florida-CEED) formed August 1, 2017, as a 501(c)(3) non-profit charitable organization in response to that voice. Florida-CEED is a cooperative business resource center that provides education, business development, workshops, program development, community outreach, and coalition growth. Florida-CEED is honored to be housed at Pinellas Technical College (PTC) located in St. Petersburg, FL. PTC and Florida-CEED are taking the lead in the innovation and development of new ways to apply cooperative business development to the hands-on workforce.